Posted on January 31st, 2019 in Goat's Forecast. Nothing’s been happening…and that’ll be it for the week given all the wind changes forecast. Hot now … 39 on the coast around 4pm…but a cool change is on the way…passed through Jervis Bay around 3pm doing around 40kph with gusts around 60-70 kph. You work out when it’ll get here 🙂 something to do in the heat. And here’s something else for you. I haven’t given you a singalong surf forecast for a while … close your eyes and listen. Close your eyes I said! Hahaha. Wear a hat – to dive in and out of the water. Who knows.. you might be able to catch some waves you can ride if you’re not too fussy. Hot. A mix of sun and cloud. Medium (40%) chance of showers late this afternoon and evening, with the risk of a thunderstorm, chiefly in the west. North to northwesterly winds 25 to 35 km/h in the morning, tending northeasterly near the coastal fringe this afternoon. A gusty southerly change 30 to 45 km/h in the late afternoon and early evening, possibly reaching 65 km/h near the coast. Cloudy. Medium (60%) chance of showers, most likely in the afternoon and evening. Winds southerly 25 to 35 km/h decreasing to 15 to 25 km/h early in the morning then turning southeasterly during the afternoon and evening. Cloudy. High (70%) chance of showers, most likely in the morning and afternoon. The chance of a thunderstorm in the morning and afternoon. Winds east to southeasterly 15 to 20 km/h tending east to northeasterly 15 to 25 km/h during the day. Mostly sunny. Light winds becoming northeasterly 20 to 30 km/h during the day. Mostly sunny morning. Medium (50%) chance of showers, most likely later in the day. The chance of a thunderstorm later in the day. Winds north to northeasterly 15 to 20 km/h shifting southerly 25 to 35 km/h during the morning. Cloudy. Medium (60%) chance of showers. The chance of a thunderstorm. Winds southerly 15 to 25 km/h turning southeasterly during the day. Posted on January 31st, 2019 in Dee Why. Was hoping to see a little more energy this morning, but as of 0730 Dee Why was seeing 9-11 kts of NNE breeze and no real sign of anything surfable. The MHL buoy was seeing 1.5 m of 7-sec bump from the NE as well as some equally weak stuff from the SE. The wind will pick up from the north and get into the 15-25 kt range before a 20-39 kt south change late in the afternoon. Unfortunately it doesn’t look as though we’ll get any significant improvement to the surf intensity until after dark. Tomorrow should see more south swell out at sea, but period’s predicted to be around the 8 second mark, so we probably won’t see anything much away from the south magnets. And even there, the biggest spots are going to be smashed by onshores too. It’ll be interesting to see what the Goat says later today…. We’re going to 38 along the coast today and UV will be extreme from 0900 to 1720. So protect your skin, take care and stay hydrated. A weakening high pressure system near New Zealand extends a ridge towards the northern New South Wales coast, while a trough extends diagonally from the state’s northwest to southeast. This trough will become mobile today as a cold front passes to the south, bringing a gusty southerly change to southern and central parts of the coast. The trough is expected to stall and weaken on the northern coast during Friday as a new high shifts from the Bight to the Tasman Sea, resulting in a gradual return to northeasterly winds along most of the coast during the weekend. Northerly 15 to 25 knots, reaching 30 knots offshore at first. A gusty southerly change 20 to 30 knots in the late afternoon or evening. 1.5 to 2.5 metres, decreasing to 1 to 2 metres during the morning. Mostly sunny day. The chance of a thunderstorm this afternoon and evening. South to southeasterly 15 to 25 knots tending east to southeasterly 15 to 25 knots in the afternoon. Winds reaching 30 knots early in the morning. Cloudy. 50% chance of showers. The chance of a thunderstorm offshore in the afternoon and evening. Easterly 15 to 25 knots tending northeasterly 15 to 20 knots during the afternoon. 1.5 to 2.5 metres, decreasing to 1 to 1.5 metres during the afternoon. Easterly around 1 metre, increasing to 1 to 1.5 metres during the afternoon. Partly cloudy. 60% chance of showers. The chance of a thunderstorm in the afternoon. Posted on January 30th, 2019 in Dee Why. Swell such as it is, is currently wafting in mainly from the NE at a metre or so with a gutless 6 second period. A south change overnight Thursday is still on the cards. 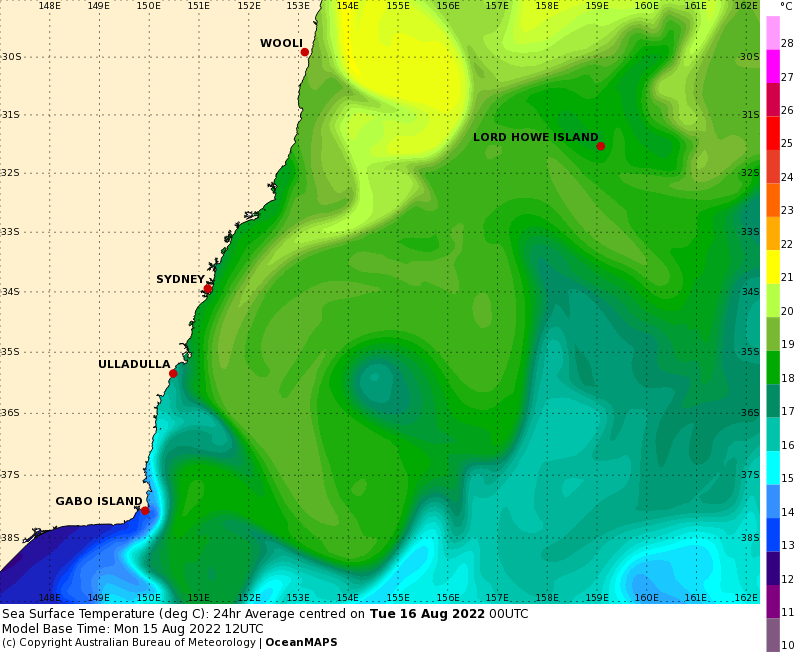 And the models continue to show a boost in swell height with it. Should go into the 2-3 metre range as it fills in, but periods are a set to stay around the 8 second mark. Friday should be cooler but southerly all day under cloudy skies with junky waist to chest plusses at standout south spots…maybe! Have a fine old day everyone! North to northeasterly winds have become established over the waters with a ridge extending to the northern coast from a high near New Zealand. Winds will freshen in the southern half today ahead of the next southerly change, expected over southern Waters during Thursday. North to northeasterly 15 to 25 knots, reaching up to 30 knots at times. North to northeasterly 15 to 25 knots, reaching up to 30 knots at times, ahead of a south to southeasterly change 20 to 25 knots in the evening. Mostly sunny day. The chance of a thunderstorm in the late afternoon and evening. South to southeasterly 20 to 30 knots turning easterly 20 to 25 knots during the evening. Northeasterly 1 to 1.5 metres, decreasing below 1 metre during the morning. Posted on January 29th, 2019 in Dee Why. Posted on January 28th, 2019 in Dee Why. Late start for you correspondent. But it seems I’ve not missed alerting you to great surf opportunities in a timely manner. The overnight showers and lightning show have disappeared, leaving us with murky grey skies, light winds and not much of anything in the way of waves. There were a few bods flopping about at the point and along the beach, but size looked to be in the sub-knee high range. Tide’s just come off the 0920 low and is now gradually filling into the modest 1.36 high at 1520. Wind should get itself organised later, but for now it’s 7-9 kts from the south. By this afternoon we should be looking at 15-20 kts or so. Water quality is okay at Dee Why, but south of there Beachwatch has hoisted the “pollution possible” warning for most spots. There still seems to be some hope of more wave energy at the end of the week, but depending on the model, if it does pick up, there’ll be heaps of onshore wind with it – and showery skies too. Roll on autumn! A trough along the Hunter coast is directing southerly winds over southern and central coastal areas and is expected to dissipate later today. This will allow a ridge over northern parts of the coast to stretch throughout by tonight, with north to northeasterly winds forecast to extend across the waters by early Tuesday. Winds freshen in the southern half on Wednesday ahead of the next southerly change, expected over southern Waters during Thursday. Inshore winds southerly 15 to 20 knots until the evening. Otherwise winds north to northeasterly 15 to 20 knots. 1 to 1.5 metres, increasing to 1.5 to 2 metres inshore. Southerly around 1 metre, increasing to 1 to 1.5 metres around midday. Northeasterly 1 to 1.5 metres, decreasing to around 1 metre around midday. Cloudy. Possible drizzle patches, mostly inshore, with the chance of reduced visibility. North to northeasterly 15 to 25 knots, reaching up to 30 knots offshore in the late evening. Northeasterly 20 to 30 knots. Posted on January 27th, 2019 in Dee Why. Another “I don’t care, I’m getting wet” day along the beaches. Although wave quality is in the 1-star range, there should be the odd chest high face amongst the knee to knee and a bit bumps at magnet spots this morning. Don’t expect it to be uncrowded. Even at Dee Why with it’s less than optimal orientation, there were a fair number in. Tide was low at 0810 and is currently coming into the 1.5m high at 1415. Coastal temps are predicted to peak at 32 and UV is an extreme 13 until 1720 – so look after your skin! The short period wind swell looks like hanging in there all week, but the models show it gradually getting bigger and peaking in the 2+ metre range toward Friday. Unfortunately the wind call is for blasting southerlies from the get-go on Friday morning. So, not a hopeless outlook for the week ahead. Go well! A persistent ridge over the northwestern Tasman Sea is maintaining north to northeasterly winds along the north coast. A southerly change over the far south coast this morning will extend northwards to central parts of the coast during the day today. The trough is then forecast to dissipate later on Monday, with north northeasterly winds expected to extend throughout during Tuesday under the influence of the ridge. Northerly 15 to 25 knots, tending southerly 10 to 15 knots inshore at first. Winds shifting southerly 15 to 20 knots in the middle of the day. Northeasterly around 1 metre, increasing to 1 to 1.5 metres around midday, then increasing to 1.5 to 2 metres by early evening. Mostly sunny day. The chance of a thunderstorm inshore late this afternoon and evening. South to southwesterly 15 to 20 knots shifting north to northeasterly in the evening. Winds reaching up to 25 knots offshore in the late evening. 1.5 to 2 metres, decreasing to 1 to 1.5 metres during the morning, then decreasing below 1 metre by early evening. Northerly 20 to 30 knots tending northeasterly during the morning. Around 1 metre, increasing to 1.5 to 2.5 metres during the morning. Posted on January 26th, 2019 in At large. As of 0630 it was hazy along the beaches, but there were waves at places that like NE wind swell. Northy was well populated with folk chasing the gentle looking waist to chest high little waves but South Narrabeen was empty, even though it sort of looked surfable. Around the corner at the Longy to Dee Why stretch the best options seemed to be between No Mans and the Pole. Size was a touch smaller than Northy and, if anything, it also appeared to be even weaker. Despite the NE look to the line, the MHL buoy was reporting a metre at close to 12 seconds from the SE (128 to 148°). Although it was pretty glassy when I grabbed the pics, half an hour later at 0700 North Head was seeing 8-11 kts of NNE wind. We can expect that to dial up some more ahead of a south change this afternoon. Tide was low at 0710 and will be back to a 1.7m high at 1320. Beachwatch says the water should be fine pretty much everywhere and averaging 21C. We’re due to reach a high along the coast of 33 C and there’s a poor air quality alert for elevated ozone pollution. UV is a fierce 13 and sun protection is a must from 0900 to 1730. If the forecast models have it right, tomorrow will play out much like today, but there might be a touch bigger as we get a mix of NE and south energy. The morning looks the best shot too. The rest of the week is shaping to be roughly the same as far as waves go (although waves will be more east), but wind will be a factor in the afternoons (nothing unusual in that). Have a top old Australia Day everyone. A trough over the southern waters will extend to central parts of the coast during the day today, with an associated weak southerly change. A second southerly change is likely to move through the southern half of the coast on Sunday, before stalling along the Hunter coast later Sunday and weakening by Monday evening. A ridge remains firm over the northern parts of the coast for the next several days, and is forecast to extend across the entire coast on Tuesday, generating north to northeast winds. North to northeasterly 15 to 20 knots, reaching 30 knots offshore early in the morning, turning southerly in the afternoon. 1.5 to 2.5 metres, decreasing 1 to 2 metres during the afternoon. Northerly 15 to 25 knots shifting southerly 15 to 20 knots in the late morning. Northeasterly 1 to 1.5 metres, increasing to 1.5 to 2 metres by early evening. Southerly 15 to 20 knots tending north to northeasterly 20 to 30 knots during the evening. Northeasterly 1 to 1.5 metres inshore, increasing to 1 to 2 metres offshore. Posted on January 25th, 2019 in Dee Why. Posted on January 24th, 2019 in Goat's Forecast. Nothing too exciting happening, now or through the week ahead. Today there’s about 1 metre or so of sort of waves from the South East that are getting into places that are open to it, but it’s messy with the wind behind it. Looks like it’ll be pot luck if you find a suitable wave at the right place, right tide. Have a good one and have a Happy Australia Day Long Weekend! Cloudy. Medium (50%) chance of light showers or drizzle, mainly in the morning. Winds south to southwesterly 15 to 25 km/h turning east to southeasterly 15 to 20 km/h in the afternoon. Partly cloudy. Light winds becoming northerly 15 to 20 km/h in the middle of the day then tending northeasterly 15 to 25 km/h in the late afternoon. Hot and mostly sunny. Light winds becoming southeasterly 15 to 20 km/h during the day then becoming light during the evening. Partly cloudy. Medium (50%) chance of showers, most likely in the afternoon and evening. The chance of a thunderstorm in the afternoon. Light winds becoming south to southeasterly 25 to 35 km/h during the day then becoming light during the evening. Cloudy. Medium (50%) chance of showers, most likely during the morning. Light winds. Partly cloudy. Slight (20%) chance of a shower. Light winds becoming east to northeasterly 15 to 20 km/h during the day. Posted on January 24th, 2019 in Dee Why. Thick overcast at 0800 this morning. Wind was coming from the SW at 9-12 kts. The 0600 data from the MHL buoy was showing 1.3 metres of 10-sec south swell. As the pics show, it may be 1.3 metres offshore, but along the beaches it’s close to flat – again. 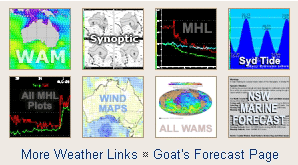 I’m not too excited about the outlook after scanning the forecast models, so I’m hoping when the Goat drops his week-ahead outlook later today that he’ll see some glimmer that I’ve missed. In the meantime, have a top old Thursday and go well with your plans for the day. A high pressure system lies over the Tasman Sea, while a trough stretches from central Australia through western New South Wales. This pattern has established northerly winds over the northern half of the coastal waters while a trough has brought about a fresh to strong southerly change to the southern and central waters. This trough will weaken on Thursday as the Tasman high asserts its dominance and winds will tend to the north again during Friday. Another trough and associated southerly change will briefly enter the southern coastal waters early Saturday morning and will extend to central waters during the day. With a more dominant southerly change moving up the coast on Sunday. Southerly 15 to 20 knots becoming variable about 10 knots in the evening. 1 to 1.5 metres, decreasing to 1 metre around midday. Southerly around 1 metre inshore, increasing to 1 to 1.5 metres offshore around midday. Variable about 10 knots becoming northeasterly 15 to 20 knots in the middle of the day. Winds reaching up to 25 knots offshore in the late evening. North to northeasterly 20 to 25 knots.